Don’t be surprised in the opening! 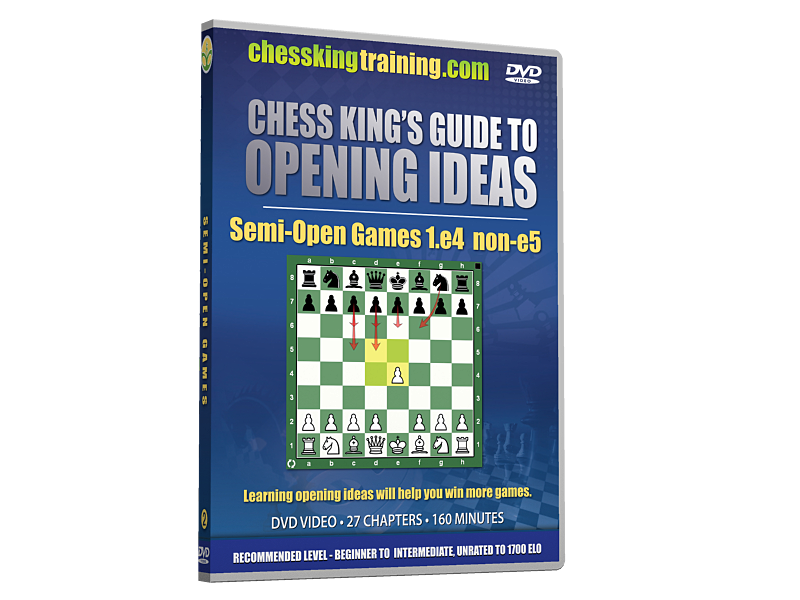 Chess King's Opening Ideas DVD Course is the quickest way to learn the ideas, plans and goals behind the major chess openings. Just watch the moves and listen to their explanations. Over 8 hours of instruction in over 90 chapters in this amazing openings video encyclopedia! Recommended for players Unrated to 1700 Elo. The DVD video format makes it simple to improve your chess. Just watch, listen and learn. This Course is a fountain of knowledge for parents and coaches. The set contains close to 8 hours of structured instruction. Ideal for Junior and improving players to reach club player level and to optimize their opening repertoire and understanding. Useful for parents and coaches to gather material for their chess lessons. The high quality DVDs feature 12th Women”s World Chess Champion and Chess Queen™ Alexandra Kosteniuk and a portion of the proceeds go to support her Chess Fund. This is Volume 2 of the Series: Semi-Open Games 1. e4 others. French, Caro-Cann, Pirc, Scandinaviam Alekhine, Sicilian defense (Dragon, Sveshnikov, Najdorf, Closed, Alapin, Smit-Morra), etc. 27 chapters, 160 minutes. Check out the 3-DVD combo and other combos for savings up to 50%. The DVD is zone "0" which means it is guaranteed play anywhere in the world (including USA zone 1, Europe zone 2, etc. ), and it works on any normal DVD player or PC or Mac.